Being overweight in the summer heat is no fun. And exposing a fat stomach or fat thighs isn’t exactly pleasant when everyone else around you is wearing gnat-sized beachwear and drizzling oil onto wasp-like abdomens. In fact, for people carrying excess weight, summer can be an unpleasant trial involving countless opportunities for embarassment and discomfort. So let’s take a look at how you can reduce some of your fat and make next summer a happier experience. But first, a warning. One guaranteed way to fail is to look for a “short cut” weight loss method or diet. You know what I mean: the type of program that promises “a fast effortless way to reduce weight”. In my experience, none of these diets or pills actually work, and the medical evidence is quite clear: the maximum rate of sustainable fat loss is between 1 and 2 pounds per week, perhaps a little more if you are obese. Besides, if a brilliant scientist did manage to concoct a formula for rapid effortless weight reduction, overnight he would be more famous than Einstein. He certainly wouldn’t be peddling his program in 30-second TV infommercials or mail-order advertisements. So for the sake of your sanity as well as your financial health, don’t waste time on weight loss methods that make extravagant claims. If you don’t believe this, think of any of your overweight friends who favor the short-term “lose 20 pounds in two weeks” type of approach, and ask yourself why they are still overweight. You can’t lose much weight in a week or two. You need about three months to make a significant impact on your body shape. Remember, the human body is interested in survival, not cosmetic appearances, and since rapid weight loss is a prima facie symptom of disease not good health, the only guaranteed way to improve your body shape is to adopt a gradual approach of healthy eating and increased exercise. In three months, you can lose about 26 pounds – more than enough for most overweight people to experience noticeable health improvements as well as a much leaner body. And by reducing your weight gradually in this manner, you have far less chance of weight regain, so if necessary you can continue losing more with less danger of incurring a weight loss plateau or other obstacle. No one likes to change their habits. So if you want to change your eating and exercise habits, you need a strong motive – something to keep you dieting and exercising when boredom sets in. Whatever motive you choose, it must be something more powerful than the urge to eat tasty high calorie foods in front of the TV! Anything that commits you in advance to achieving your weight loss goal, makes a great motive. So be bold. Book an expensive beach holiday, or buy some gorgeous clothes to fit the body you want to have at the end of your diet program. Both these actions require you to succeed, and therefore provide constant motivation along the way. In my experience, both with private clients as well as dieters who belong to my weight loss forum, men and celebrities exhibit the strongest motivation. Men, I suspect, because typically they have a narrower range of daily tasks and responsibilities than women. Celebrities, because typically they have a powerful commercial motivation to maintain their physical appearance. I offer weight loss help to a number of celebrity figures, some of whom are regulars on my forum, and I am always impressed with their ability to make short-term sacrifices to further their longer term goals. I guess that’s why they achieve so much. Whether you’re trying to lose weight for the summer, save money or pass exams, an important piece of the motivational jigsaw is your ability to be positive about making short term sacrifices. The choice is fairly simple: you can focus on the “deprivation” involved in giving up certain foods, or you can focus on the benefits you will get by not eating these foods. Sadly, many dieters focus on feeling deprived. After a while they see their diet as a burden, a bore, an evil necessity. This is why so many of them quit. They can’t “see” the benefits that weight loss will bring them. 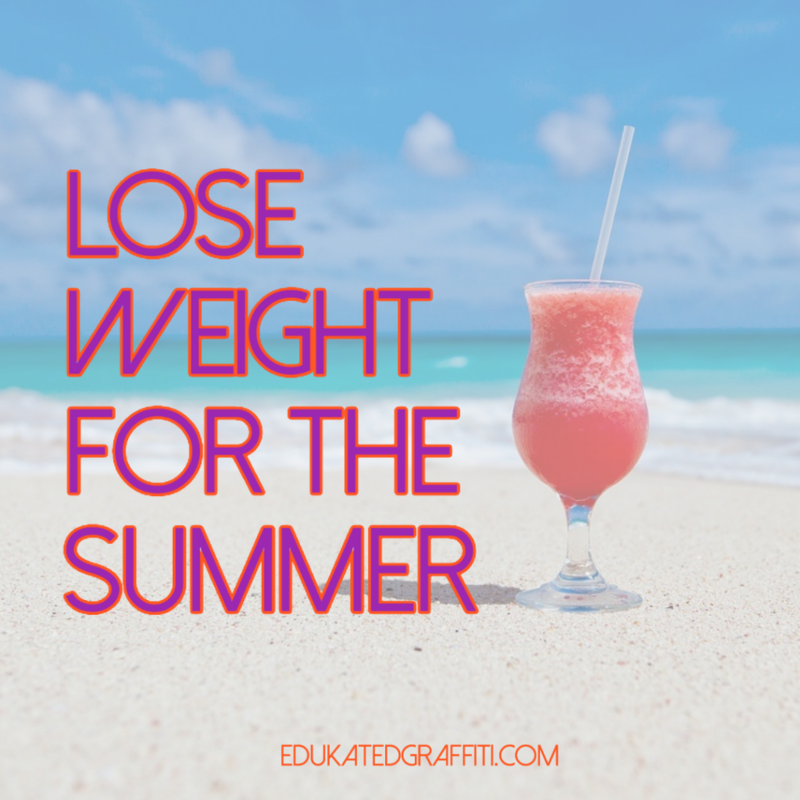 If you want to improve your body shape for the summer, you must avoid this trap and appreciate the longer term benefits you will receive by making short-term adjustments to your lifestyle. Many of our tastes, food cravings, and general attitudes to food are strongly influenced by what we eat and drink. I know countless mothers with families who have reported astonishing changes in their personal and family eating habits after less than three weeks of improved eating. Point is, the average modern diet is loaded with sugar, fat and sodium, all of which condition us to want more of these items. But if you can break out of this dependence on junk-ingredients for even 2-3 weeks, you’ll notice a huge difference in your tastes. Which brings me to healthy eating. In my experience, one of the most effective weight loss strategies is to focus on healthy eating. I’m not saying you shouldn’t stand on your weighing scales, just don’t measure progress exclusively by what the scales say. Be aware that it’s just as important to enjoy your food and feel good about your change of eating habits. And any diet you hate is guaranteed to fail, no matter how much weight you lose, because as soon as you achieve your goal, you will revert to your old eating habits and regain every pound lost. In a nutshell, a healthy diet involves (1) More home-cooked food, less eating out. (2) More fresh fruit as snacks. (3) More fresh vegetables as snacks and with meals. (4) More beans as sides or in stews. (5) More dense chewy bread, less refined white breads and bread snacks. (6) More fish, skinless chicken/turkey, less red meat. (7) Smaller servings of red meat, larger servings of vegetables. (8) Eating low fat dairy foods. (9) Adding less fat in the form of butter, mayo, sour cream, to the food on your plate. This is a huge source of excessive calories. (10) Stocking up with healthy snack foods to keep hunger at bay. If you fill up with healthy nutritious calories, you won’t want the junk foods that hunger makes you eat. As far as weight management goes, hunger remains Public Enemy Number One. Exercise does burn extra calories and therefore does help to widen your calorie deficit. But it’s direct effect on weight loss is typically quite small. In fact, it’s not uncommon to gain weight when you start exercising. The real weight reduction benefits of exercise are indirect ones. It raises our metabolic rate, helping us to burn calories at a slightly faster rate, and improves our mood, which typically reduces our need for comfort-eating. However, don’t overdo your exercise workouts. I’ve lost count of the number of dieters who started exercising too vigorously and burnt out within 3 weeks. Ideally, start with 45 minutes/day of any physical activity you can easily manage, and very gradually increase the duration and intensity. Listen to your body at all times, and be sure to loosen up beforehand and wind down afterwards. If your goal is a waistline you can proudly display in the sun, then don’t wait until it happens to “see” it. Visualize it from the moment you start dieting. Visualize yourself walking along a beach, or lying next to the pool with a perfectly flat stomach. Whatever your ambition for your weight or body, get used to visualizing it in the greatest possible detail. Because “seeing it” is the first step to making it come true. As they say, one picture is worth a thousand words. Very Overweight? Just Visualize The Benefits! If you have a lot of weight to lose (100 pounds+), you may not think that losing 26 pounds in three months is particularly worthwhile. If so, ask yourself this question. What’s the alternative? No matter what method you choose, you won’t lose weight any faster, so it’s only a question of when you start and how long it’s going to take. I can answer the last question right now. Losing 100 pounds takes about a year – typically a little longer to allow for disasters along the way. Fifteen months would be a more realistic time span to reduce weight by this amount. This is nothing. Just visualize yourself walking down the street 100 pounds lighter, and tell me that eating healthily for 15 months is too high a price to pay for such a wonderful prospect. If you really want to lose weight for the summer, your first priority is to find support. Join a diet-group at work, or a fitness class, or go to weight loss meetings. Or join an online forum. Losing weight on your own is perfectly possible, providing things go well and your scales keep saying nice things. But when difficulties arise, as they surely will, having the support of real people can make all the difference between success and failure. If you experience difficulty finding support, try my own weight loss forum. It’s great fun and very inspirational.